The temperature measurement is an integral part of tracking progress throughout the tap-to-tap cycle in steel making. Expendable probes are also used for tracking bath carbon content and dissolved oxygen levels in the steel. These tools have enabled the tap-to-tap cycle to be accelerated by eliminating long waiting periods for lab results, thus increasing productivity. Disposable probes are typically mounted in cardboard sleeves that slide on to a steel probe (pole) which has internal electrical contacts. The disposable probe transmits an electrical signal to the steel pole, which in turn transmits the signal to an electronic unit for interpretation. Almost all probes rely on an accurate temperature measurement to precisely calculate carbon or oxygen levels. Sampling and temperature measurement are carried out by consumable cartridges introduce into the liquid steel. 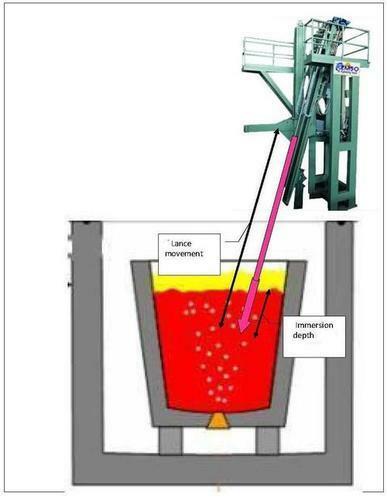 Remso produces manipulators for EAF through slag door or through the roof, LF, VD and VOD with the aim to carry out a temperature measurement and to get a sample of the melted metal in a fully automatic way. The Sampling and Temperature Manipulators control can be supervised from the control room and the results will be automatically transferred to the control system and the visual display unit. One or two independent carriages moved by gear motors. Position of the lances monitored by encoders. Anti collision device to avoid any damage to the lance in case of impact with some no liquefied pieces. Water-cooled panel in front of the manipulator to protect it from the heat. Air fan to keep arm and carriages cooled. Slag breaker to open the slag on the top of the liquid steel. Possibility to measure hydrogen content. Possibility to make measurement with ladle in vacuum condition. Manipulator for emergency stirring lance (designed to blow the inert gas – Argon – into the melted steel bath in case of failure of porous plug system). Increase of the quality and of the reliability of the measurements due to their reproducibility. Looking for “Automatic Temperature Sampling Manipulator”?